Emil Brunner (December 23, 1889 – April 6, 1966) was an eminent and highly influential Swiss theologian. Along with Karl Barth, he is commonly associated with Neo-orthodoxy or the dialectical theology movement. 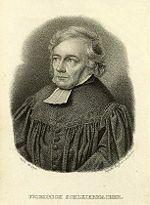 After being educated in both Europe and the United States, Brunner became professor of systematic theology at the University of Zurich and soon developed a strong reputation for his challenge to the prevailing liberal theology of his day. While rejecting the blind faith of fundamentalism, Brunner emphasized the need for personal repentance and a direct encounter with God through Jesus Christ. He, thus, reaffirmed the basic Christian faith, while also confronting the intellectual challenges which had produced what he saw as a major crisis in civilization. At first a close friend and ally of Karl Barth, Brunner split with Barth over the question of grace, affirming a less devastating effect of original sin on human nature than Barth did. Especially during their earlier careers, he was better known than Barth in the United States. Although Brunner's optimism about human nature and his reticence to affirm the inerrancy of the Bible made his views suspect among later evangelical and fundamentalist Christians, he remains one of the most influential theologians of the twentieth century. Brunner was a strong critic of the liberal theology of Friedrich Schleiermacher. Emil Brunner was born near Zurich in 1889. He studied at both the universities of Zurich and Berlin, receiving his doctorate in theology from Zurich in 1913. The title of his doctoral dissertation was: The Symbolic Element in Religious Knowledge. Brunner served as pastor from 1916 to 1917, in the mountain village of Obstalden in the Canton of Glarus. He spent a year in New York, at Union Theological Seminary studying (1919–1920), where he was the seminary's first exchange student after World War I. In 1921, Brunner wrote what he considered a second dissertation: Experience, Knowledge, and Faith. Soon, another book followed: Mysticism and the Word. This work was a devastating critique of the liberal theology of Friedrich Schleiermacher. Brunner was rewarded for his literary efforts with the appointment as the professor of Systematic and Practical Theology at the University of Zurich from 1924-1955. In the next few years his reputation continued to increase, particularly with the publication of two more books, the first, The Philosophy of Religion from the Standpoint of Protestant Theology, and second, The Mediator. In 1932, following a few years of receiving invitations to visit and lecture across Europe and the United States, which he accepted, Brunner wrote God and Man and The Divine Imperative. Brunner continued his theological output with Man in Revolt and Truth as Encounter in 1937. In 1938–1939, he again visited the U.S., when he agreed to a visiting professorship at Princeton Theological Seminary. He returned to Europe prior to World War II and was an outspoken opponent of Nazism. Following the war, Brunner was invited to give the distinguished Gifford Lectures at the University of St. Andrews, (1946–1947) in Scotland, the title of his lectures being Christianity and Civilization. His teaching career concluded in 1953–1955, at what was then the new International Christian University in Tokyo, Japan, but not before the publication of his three volume Dogmatics. Volume One was titled The Christian Doctrine of God. Volume Two was titled The Christian Doctrine of Creation and Redemption, and the final volume was titled The Christian Doctrine of the Church, Faith, and Consummation. On the return journey from Japan to Europe, Brunner suffered a cerebral hemorrhage and was physically impaired, weakening his ability to work productively. Though there were times when he felt better during the next nine years, he suffered further strokes off and on, finally succumbing to death in 1966. Brunner rejected liberal theology's portrait of Jesus Christ as anything less than God incarnate, insisting that both the Incarnation and Jesus' atoning death and resurrection were central to salvation. He thus opposed the propositions of both Schleiermacher and Ritschl, while joining with Karl Barth in the promotion of Neo-orthodoxy. He later broke with Barth, however, on the question of grace, affirming that humans were not totally depraved by the Fall, and that a "point of contact" remained between God and humans even without the grace of salvation through Jesus. Some observers see Brunner's theology of grace as attempting to find a middle position within the ongoing Arminian and Calvinist debate, holding that Christ stood between God's sovereign approach to humankind and the free acceptance of God's gift of salvation. After 1937, Brunner's theology was strongly influenced by the theology of Jewish theologian Martin Buber. Brunner thus stressed that the Christian revelation is a type of personal encounter with God. The Divine-Human Encounter (1937), Man in Revolt (1938), and Revelation and Reason (1941) all show Buber's influence. While Brunner insisted on the unique salvific value of the Christian faith, he was also strongly interested in a dialog between Christianity and secular life. He, thus, strongly opposed Nazism and Communism as threats both to religious freedom and western civilization. Brunner's 1928 lecture series published as The Theology of Crisis is widely considered to be one of the best expressions of Neo-orthodox theology. Here, Brunner identified five main themes of the classical protest against Protestant liberalism. The Theology of Crisis. This refers to the early twentieth century as a crucial turning point, in which the West, including Christian theology itself, was in a rapid state of dissolution. Christianity is not a system of ethics, nor can it be understood with reference to science and historical criticism. It is either faith in God's revelation, or it is nothing. In substituting belief in Jesus as Savior for belief in Jesus as the model of an ideal human, liberals rob Christianity of its uniqueness, truth, and power. Nevertheless, Christians do not need to choose between modernism and fundamentalism: They may refine their understanding of the Bible in light of rationalism and critical thought, without compromising on the essential truth of God's revelation through Jesus. Revelation. Neither science nor metaphysics reveals the ultimate truth, which is found only through a passionate search in which one's whole life is at stake. Moreover, God cannot be directly encountered in the world, for the essence of God is transcendent. God's immanent nature may be encountered fully only through Jesus Christ, who is God incarnate. Salvation. Human life is dialectical and paradoxical. No one can escape death, no matter how hard one tries. Furthermore, evil is a collective reality, in which all humans share a common guilt. Humankind does evil because he is evil, since the original fellowship with God is broken. Only repentance and reconciliation with the living God can heal this. Even though Christians remain sinners after being saved, they receive a new strength to live more perfectly by faith, after determining to put God's will before their own. Ethics. Faith in God's Word is the only sure foundation for ethics, as faith alone produces the energy necessary for true moral renewal. Modern ethical systems based on self-esteem and self-realization are ultimately useless, because they fail to deal with the problem of sin. Each person is hopelessly broken and in need of salvation, a situation that requires confession and repentance to God before one can hope to reform oneself. Yet, this reformation is not only an act of God, but requires human cooperation in the form of the courageous act of turning away from sin back toward God's will. Progress. While science—including evolution—is not to be dismissed, evolutionary theories do not account adequately for progress. The art of Michelangelo, the music of Bach, or even the religion of Zoroaster cannot be explained by science alone, but must admit to the inspiration of a higher power. God's kingdom is thus a matter of the dramatic in-breaking of God's spirit, rather than of evolution. It is not a movement of man's gradual progress toward God, but of God's revelation to humans. Ultimately, however, Christianity is the most optimistic of religions, affirming that, in the end, humans will see God face to face. Brunner and Barth, though originally friends and colleagues, came to differ dramatically over their theological views. Barth once described their relationship as similar to that of a whale and an elephant. After 1934, their friendship dissolved, as Barth wrote an emphatic article declaring "Nein!" to what he characterized as Brunner's "natural theology." Brunner responded with his own strongly worded attack on Barth, and the two former friends did not meet for 30 years after these incidents. Long before Barth's name was known in the U.S., Brunner was considered to be the chief proponent of the new "dialectical theology," better known as Neo-orthodoxy. In the U.S., Brunner's books were translated much more quickly than Barth's works. Considered by many to be the minor partner in the uneasy relationship, Brunner once acknowledged that the only theological genius of the twentieth century was Barth. Brunner holds a place of prominence in Protestant theology in the twentieth century as one of the most important figures of Neo-orthodoxy. However, although Brunner re-emphasized the centrality of Christ, evangelical and fundamentalist theologians tended to reject some of Brunner's other teachings, such as his downplaying of the doctrine of original sin, his dismissal of certain miraculous elements within the Scriptures, and his questioning of the usefulness of the doctrine of the inspiration of the Bible. Nevertheless, he and Barth effectively challenged nineteenth century liberal theology by exposing it as ultimately a human effort to live a Godly life by emulating Jesus, rather than as God's effort to reach humans through his own self-revelation in Christ. Brunner thus holds a place of prominence in Protestant theology in the twentieth century. Campbell, Iain D. The Doctrine of Sin in Reformed and Neo-Orthodox Thought. Fearn: Mentor, 1999. ISBN 9781857924381. Hart, John W. Karl Barth Vs. Emil Brunner: The Formation and Dissolution of a Theological Alliance, 1916-1936. New York: Peter Lang, 2001. ISBN 9780820445052. Humphrey, J. Edward. Emil Brunner. Waco, Texas: Word Books, 1976. ISBN 9780876804537. Jehle, Frank. Emil Brunner, 1889-1966. Zürich: Theologischer Verlag Zürich, 2006. ISBN 9783290173920. McKim, Mark G. Emil Brunner: A Bibliography. Lanham, MD: Scarecrow Press, 1996. ISBN 9780810831674. This page was last modified on 12 October 2011, at 19:03.